Guard Danni Williams scored a team-high 16 points as the No. 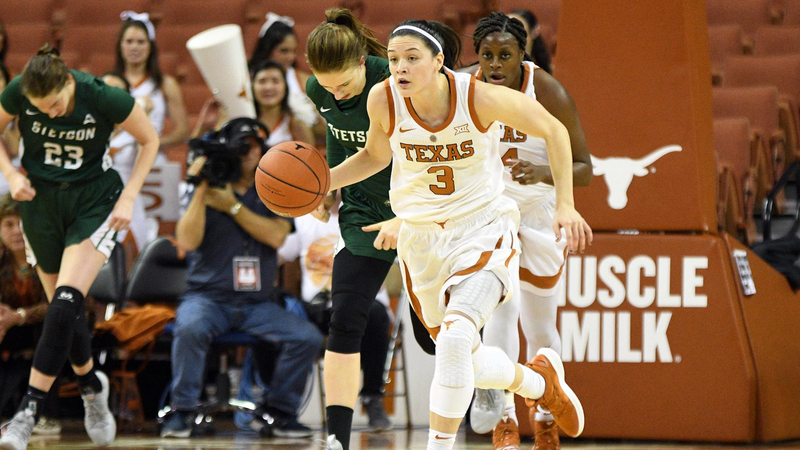 12 Texas women's basketball team rallied past Texas Texas Tech, 78-71, Saturday in Lubbock (photo courtesy of texassports.com). LUBBOCK, Texas — Guard Danni Williams scored a team-high 16 points to lead four players who scored in double figures as the No. 12 Texas women’s basketball team rallied from 14 points down Saturday to knock off Texas Tech in Lubbock, 78-71. Joining Williams with more than 10 points were guard Sug Sutton and post Jatarie White, each of whom had 12 points, and guard Destiny Littleton, who added 11. With their third consecutive victory, the Longhorns improved to 17-3 overall and 7-1 against Big 12 opponents; Texas Tech slipped to 10-9 and just 1-7 in conference games. Texas trailed, 40-35, at halftime, thanks in large part to a 13-0 scoring run by the Red Raiders. UT dominated on the glass, outrebounding its hosts, 47-33. Forward Olamide Aborowa led the Longhorns with nine rebounds, followed by forward Joyner Holmes with seven and Sutton with six. Freshman Texas Tech guard Chrislyn Carr led all scorers with a game-high 23 points, while guard Sydney Goodson and forward Brittany Brewer added 13 points apiece. But the Longhorns went on a scoring run of their own in the third quarter, outscoring Tech, 11-2, just minutes before surging ahead on back-to-back baskets by Holmes. The Red Raiders, who hit 12 three-point field goals (compared to four by the Longhorns), led by five points before Texas scored the game’s final 12 points to seal the victory. Texas now heads home to host West Virginia at 7 p.m. Monday in a game that can be seen on FS1.